The mode of a data set is the most frequently occurring value or category. This is particularly useful when tallying popularity. 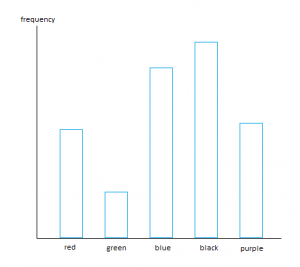 Modes can easily be identified in bar charts or histograms as being the category with the tallest bar. Similarly, in a dot plot it is the category with the most dots assigned to it. There can be multiple modes in a data set. The mode for this data set is 22. If this were a count for the age of students in a tutorial class, there are more 22 year olds in the class than any other age. 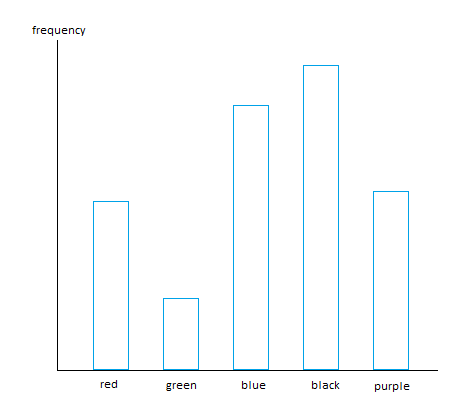 In this bar chart, the modal category is ‘black’. If this were a count for the favourite colours of students in a particular class, this means that black is the most popular colour among the students.